Updated Thursday July 26, 2018 by Chief Information Officer. 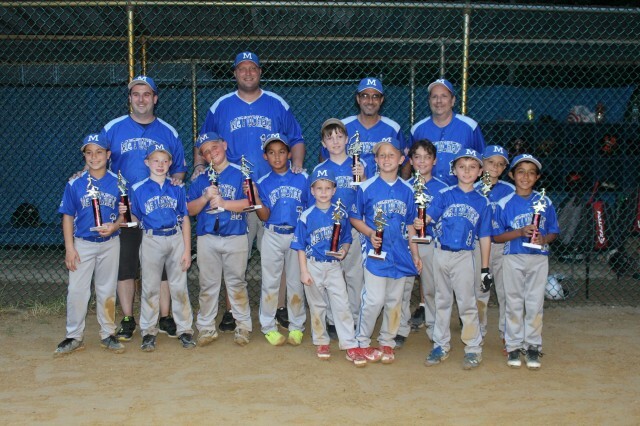 Congratulations to the Metuchen 8U team, who finished their summer season strong with a second place finish at the Slugfest Tournament in Hainesport! Metuchen was undefeated in pool play, starting off on Saturday with walk off wins against Sacred Heart (18-17) and Delran (13-12) that featured offensive contributions from the whole lineup. The team followed up that effort with a great 7-6 victory over Cherry Hill on Sunday morning, advancing in the tournament as the top overall seed. In their semifinal rematch against Delran, the boys turned out a strong defensive effort resulting in a 8-4 win. In their final game Wednesday against Liberty Bell, Metuchen fell behind in the early innings, but rallied, scoring 9 unanswered runs to fall just short of the championship with a final score of 10-9. Congratulations again to the 8U boys, and we’re looking forward to a bright future for this roster (listed below)!